Most commonly known as a ‘slipped’ disc, this condition is actually defined as a herniated disc, prolapsed disc or bulging disc. As patients know all too well, a ‘slipped’, herniated, prolapsed or bulging disc can be extremely painful. And whilst these conditions can also be difficult to treat, they can respond very well to treatment. Slipped discs are a widespread problem, most often affecting people age 35 to 50 and although these are often the most painful and difficult conditions to treat they can respond very well to treatment. Interestingly the term ‘slipped disc’ is inaccurate as no slippage of the disc actually occurs. It actually involves a bulge (prolapse) in the disc wall (annulus) or a rupture (herniation) of the disc wall. The disc wall usually breaks down over a long period of time as a result of abnormal loading through the disc. This can be a result of poor spinal mechanics, poor muscle support, poor posture, past injury, or bad working habits. The symptoms of a slipped disc vary depending on the site of the disc weakness and whether the prolapse/herniation interferes with any pain sensitive structure. 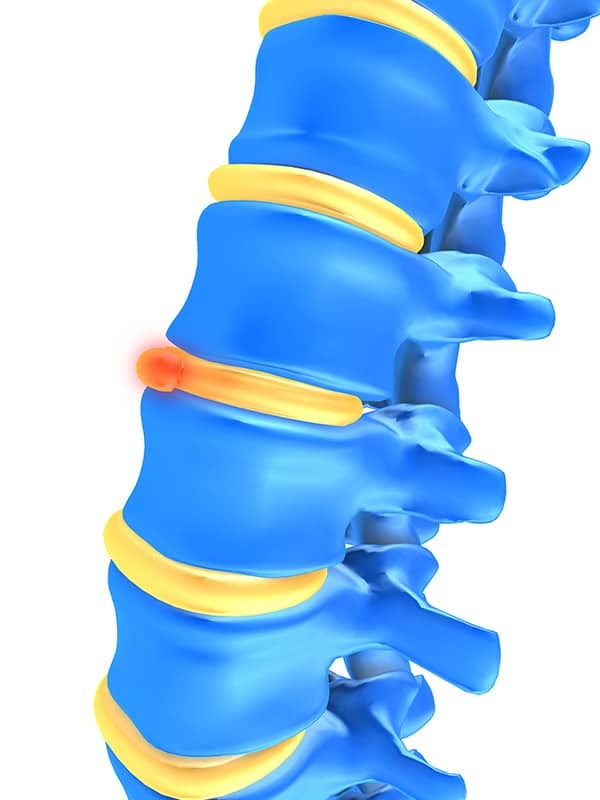 A slipped disc most commonly occurs right at the base of the spine. This can give absolutely no pain at all or can give varying degrees of leg and low back pain. Although quite rare, a complete herniation can cause paralysis of the foot and leg and loss of control of the bladder and bowel. The most common symptom of a slipped disc is sciatica if in the low back or radiating pain into the arm, if in the neck. Low back pain or neck pain may also be present but not in all cases. Sometimes the pain can start in the back or neck then seem to disappear only to be replaced with leg or arm pain. Often the irritated nerve will cause crooking and a postural change; over to the side or forward in the neck or back, along with powerful painful muscle guarding, making it impossible to stand straight. Usually larger prolapses and extrusions are more likely to give pins & needles, numbness and weakness in the arm or leg. Although very rare, a complete herniation may cause paralysis of the foot and leg and loss of control of the bladder and bowel. However, the symptoms are not as straightforward as it may seem, as there can be huge variability in symptoms. Interestingly studies have shown that between 52-65% of patients with no pain at all have been shown to have some sort of damage to their discs. So, it is possible that a slipped disc can give absolutely no symptoms at all or can give varying degrees of leg and low back pain ranging from intermittent ‘grumbly’ pain to absolute agony with or without pins & needles, numbness and weakness in the arm or leg. In some cases, an MRI scan will be necessary to confirm the diagnosis and to identify the type of disc herniation. The Sussex Back Pain Clinic specialises in these sorts of problems and we have an agreement with a local MRI provider so we can arrange this for you quickly and at a preferential rate if required. These conditions require skilled assessment and diagnosis by an osteopath and will usually need an MRI scan to confirm the diagnosis which we can arrange for you. It is very important that any pain radiating into the limb is checked quickly (usually within 72 hours of onset) no matter how minor, as fast intervention can often prevent more serious and painful conditions from developing. Leaving these conditions unresolved may lead to long-lasting damage especially to the sciatic nerve. It is therefore not wise to ignore even a mild backache or severe stiffness, especially in the morning, or any pain radiating into the leg or from ‘pins and needles’ in the foot, lasting longer than a few days as these, along with being slightly ‘lopsided’, are all early signs of discal damage, which if treated swiftly may prevent a serious and painful full herniation. If you’re suffering from slipped disc symptoms it is important to seek professional help quickly preferably from a health care practitioner who is experienced in dealing with disc conditions. These can be complex and require skilled assessment, diagnosis and treatment. Often there is an underlying process that has caused the injury, with damage to the disc occurring over an extended period of time, as a result of abnormal loading through the disc due to poor spinal mechanics, poor muscle support, poor posture, past injury, or bad working habits. If caught within the first 6 weeks – and your condition is not too severe – osteopathic treatment can be very effective. Osteopaths are skilled at finding the mechanical reasons responsible for your herniation and use effective, gentle treatments to correct these stresses. However it does take some time and often requires between 6-8 treatments to begin to get rid of the nerve pain – and longer to allow you to be able to begin to stress the disc again. But it is perfectly possible to allow the disc to heal without the need for surgery or epidural injection. If your symptoms have persisted for longer than 3 to 6 months it is unlikely that osteopathy will be able to help, especially if you have already tried this or some other form of manual therapy. Surgery is not often advised and less than 5% of all disc problems are operated on. Book a consultation today and get started on the road to recovery.